Potassium bromate is sometimes added to flour to improve baking. Bromates (including potassium bromate and sodium bromate) are chemical compounds used in chemical manufacturing and textile dyes. 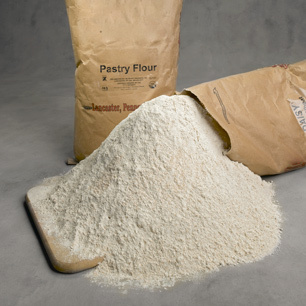 Potassium bromate is a food additive, added to some bleached flours to strengthen dough and promote rising during baking, where it is usually broken down to less hazardous bromide. It's also used in beer production. Sodium bromate is used in the extraction of gold from ore.
Bromates are not normally present in water, but can form in small amounts during water treatment involving ozonation, depending on concentrations of bromade, organic matter, pH and water temperature. Acute exposure to large amounts of bromates can lead to symptoms of nausea, vomiting, abdominal irritation, diarhea, kidney failure and hearing loss. A third of the few reported cases of acute bromate poisoning have resulted in death. After formation, bromates are difficult to remove from water. Instead, the World Health Organization recommends preventative methods during ozonation, such as pre-treatment and regulation of pH and temperature.